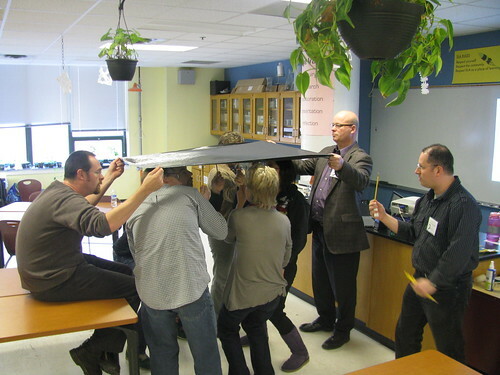 It’s hard to describe what makes Educon a different conference experience. It’s not quite a regular conference, and not an unconference either. Attendees are almost exclusively connected educators, so you’re almost better off adding them to your Twitter stream than asking their name. Sessions were called “Conversations”. Some of them were very articulated and developed, other were loosely defined and driven by the participants. Although, as an educational technologist at a research higher education institution, I am far from the K12 reality, I found that both worlds share the same concerns and challenges. Most of the discussions I had were around the following themes: shifting classroom practices, professional development, school leadership, opening up the learning experience to the world, and technology adoption. Many thanks to people who accepted to play my game and discuss their personal learning network, the videos have been made available on Youtube on this playlist. In any case, I’ll try to make this post something I can refer to later, and hopefully something others can relate to as well. Friday night panel – How Do You Sustain Innovation? Other people have done a good job at summarizing the Friday night panel at the Franklin Institute, so I won’t dig in much details. Scan through the Educon-related posts curated by Shelley Krause (@butwait) for more details. The one really useful reference I got out of the panel is the idea that innovation doesn’t just happen, it’s usually a latent problem that everyone sees but that no one has found the solution for yet. An article by Clive Thompson about the Long nose theory was referenced to describe this situation. 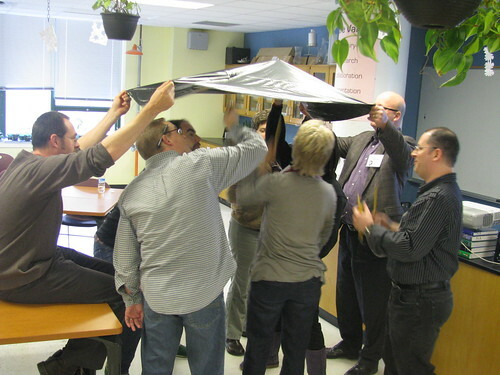 In this presentation, Gary Stager presented the idea of constructionism as a game-changer in education. Constructionism builds on constructivism, except that instead on simply being an internal mental process, it requires a physical output to demonstrate the learning. To demonstrate the power of the concept, he presented a short segment on an HBO documentary titled Masterclass showing master urbanist/architech Frank Gehry asking college freshmen to design a 1.5 million-people city. Students were left on their own with paper, markers, wooden block, and worked on a first draft. They spent tremendous efforts making this beautiful city that was eco-friendly, easy to navigate, etc., only to have Mr. Gehry come back in and say “This city could hold about 80K, not 1.5M” and storm out, leaving the students on their own, only to scrambled to make their city bigger, more dense. This segment really represented well what learning is about. Learning is about experiencing it yourself, not being spoon-fed. 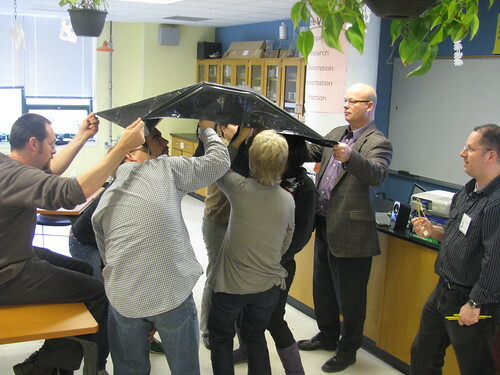 Sometime, the best teaching strategy is to get out of the way. He referenced work by Alfie Kohn to emphasize the role of playing in learning. He then tackled the idea of technology as building blocks for learning, talking about the maker movement and Super-Awesome Sylvia, a middle school kid demonstrating how to build things. This whole experience revealed a deeper reality of the 21st century. We will either teach our students to be programmed (follow the rules) or program (make their own rules). Hacking also means that you can’t get it right without getting it wrong, and learning from the experience. This session was geared toward establishing the kind of evidence needed to explain the value of personal learning networks and DIY professional development to outsiders (a.k.a. parents, administrators, etc.). An amazing shared Google doc was created to collect ideas from the audience. It emphasized the value of action research, over purely academic or vendor-based reports, to assess the value of teaching practices and educational technologies. In this session, Dean and Alec exposed instances of regular people exposing their learning challenges in public in order to get feedback and master a skill. One of the examples used was this 10 year old boy trying to understand the process of creating fire with a bowdrill set. Dean invited a student of his through Skype to explain her process of learning the American Sign Language (ASL) online, another was about Shannon, a high school vice-principal from Ottawa, Canada, sharing her flute learning process on a blog. “I thought it was a good idea to demonstrate to students that we are learners too,” she said. This equilibrium is also a matter of finding the right people to coach. You don’t want tech leaders, but you don’t want resistant folks either. You want the ones in between, those who could get on board with a little help or encouragement. You also don’t want to push potential learners too hard, they’ll push back. But don’t push enough and they’ll just stall. It’s all about balance, and being there when the need grows. Darren and Andy manage a site called the Digital Learning Project, which is the home base of this initiative (click the Educon logo on the left for the session materials). Many thanks to the awesome Chris Lehmann and the Science Leadership Academy students, teachers, and volunteers, for making this event a great one, once again. Greek sculptures representing the ancient Greek canon. As I was roaming the hallways at #Educon, trying to find the perfect stories to capture for my Ed. D. project, a couple of things emerged. As much as I wanted to get people to say certain things a certain way, nobody really was a perfect fit for my cannon open learner, or “PLNer”. But everyone had a part of the story, and every story had an extra layer or a different direction I didn’t always anticipate. I am very grateful to have seven new stories in my back pocket (actually on my Youtube channel and on my (potential) Ed. D. project site) that I can use to relate to a wide variety of audiences, as needed. I’m going to be offering a training on personal learning networks to UD staff and faculty at the end of the month, and I have no doubt that some of these stories will come in handy (I’ll stream the event as well, so that all of you can attend remotely, don’t worry). One think that struck me is that no one thinks that they are doing anything special, until they are prompted to reflect on their practices. The process of creating those testimonials probably helped the interviewees understand their learning processes a little bit more, to develop a meta-awareness of them. Another common theme is the fact that physical events and interactions are major catalysts for initiating online interactions. Many people use conferences or training sessions as springboards to their PLN. On the technical side, I simply used a Zi8 camera (too bad Kodak is going belly up), a tripod, and iMovie for the post editing. Keeping the videos short is a big help when it comes to mass-producing these. The export process in iMovie can exponentially become lengthier when videos reach 8 to 10 minutes in comparison with 2 or 4 minutes. Shorter videos are easier to produce, and are also a better fit for a web audience. Over the next week or so, I’ll create separate blog posts to analyze the testimonials, and add a layer of my own, my interpretation of what’s in them, and how they connect to my views of the canon PLNer. Hope you can comments and give me some hints on how to push this further! One thing that I have noticed over the years is that I have a hard time getting people to change their practices when it comes to using technology for teaching and learning. I think I’ve come up with a better understanding of why. As an educational technologist, I’m not one of you. I’m not a teacher, dealing with demanding students every day. I probably give the impression of being a bureaucrat that spends most of its time playing with shiny new toys. What most people don’t understand is that I don’t play with toys for the sake of it, I use them to make my life easier and connect with people, as professional development channels. Since I started my Ed.D, I think I’ve made some interesting strides towards building a better narrative to support my claims. 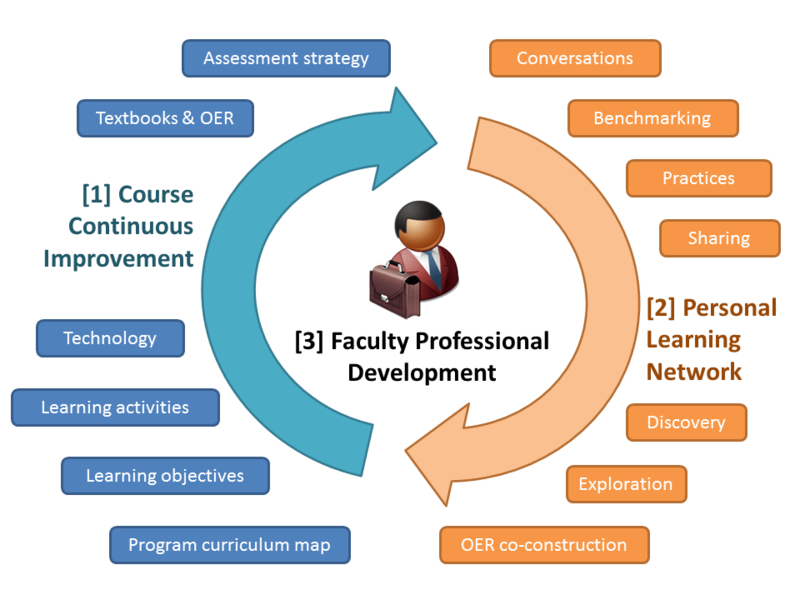 The main idea that I want to share is that open educational resources are the catalyst to 21st century faculty development, because they trigger the conversations required for continuous improvement and lifelong learning, as described in this diagram I made last fall. Because of my position, my voice doesn’t persuade teachers to move forward. Aristotle articulated, in On Rhetoric, three modes of persuasion: Pathos, Logos, and Ethos. Pathos refers to the emotional delivery and connection with the audience, logos, to the logical argument, and ethos, to the appeal or credibility of the source. I think my logos is ok, and my pathos is getting there, but without the ethos, my stories don’t get too far. So what I’d like to do during Educon is to collect “Stories of adoption” with educators who attend the conference. I want to collect real stories of real educators who changed their teaching practices by embracing a 21st century lifelong learning way of life, through the introduction of personal learning networks and open educational resources. Stories of how you have influenced colleagues are also welcome. I’ll bring my video camera to capture those Youtube-style stories, share them openly, and embed them in my narrative as needed. If you’re attending and you’re interested, let me know, as a comment to this post, or by email at mathieu AT udel DOT edu. As I’m digging a bit more into open education, it is time for me to really get my hands dirty, so I’ll try to earn my badges in David Wiley’s Introduction to Openness in Education open course this winter. I already have a winter class at the University of Delaware with Dr. Fred Hofstetter (EDUC 818 Educational Technology Foundations — yes, I’m revealing that I’m taking a class as a part of my program, take that, FERPA! ), so this might be a strech, but I’ll give it a shot.